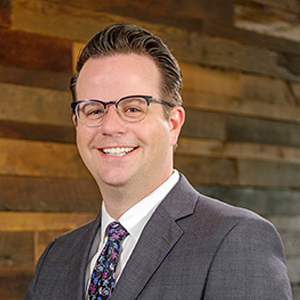 Ryan leads the operational oversight, strategic development, and community engagement efforts for Northeast Indiana Regional Partnership’s Regional Initiatives. Ryan has served as a member of the team in various capacities since 2006. He holds a bachelor’s degree from Indiana University and earned his juris doctor from the Indiana University Maurer School of Law in 2010. He currently serves on the board of directors for ARCH and Arts United of Greater Fort Wayne. Every year, Ryan and his close friends host a potpie-making party using creative recipes and ingredients. Ryan really loves biscuits and gravy! He says he could win any biscuit-and-gravy-eating contest hands down, but don't be suprised when he says the best biscuits and gravy in Northeast Indiana are at Lakeland High School’s cafeteria. When he’s not at work, Ryan and his wife, Cara, are most likely working on home-improvement projects for their fixer-upper.